Today I found out Mississippi didn’t officially outlaw slavery until 1995. While the Thirteenth Amendment was set into law, thus outlawing slavery anywhere in the United States, on December 6, 1865 when it secured the needed 27 of 36 states’ approval (3/4), it wasn’t until 130 years later on March 16, 1995 that Mississippi finally got around to ratifying the Thirteenth Amendment. As you might expect, this made Mississippi the last state to ratify it, with the previous state of the initial 36 being Kentucky in 1976 and before that Delaware in 1901. All three of those states, along with New Jersey, initially rejected the amendment in 1865, though just 9 months after rejecting it, New Jersey changed their mind and ratified it. The others took a little longer. 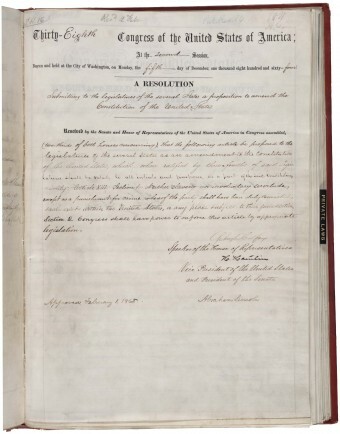 This Corwin Amendment managed to make it passed the House and the Senate in March of 1861 and was signed by President Buchanan thereafter. Ohio, Maryland, and Illinois ratified it. Although, once the American Civil War started, the Corwin Amendment lost any momentum it had, because it had largely been proposed to forestall the chance of a Civil War. Once the war started, Ohio rescinded their ratification. The Corwin Amendment was passed without an expiration, so it’s still on the table today for states to ratify, if they so choose. The most recent attempt to do so was in Texas in 1963, with a resolution to ratify it put forth by Republican Henry Stollenwerck from Dallas. This failed to generate any momentum for the Corwin Amendment, though, and the resolution wasn’t considered by the state legislature. This case was brought before the Supreme Court after the passing of the Conscription Act of 1917. After this Act was passed, military tribunals tried various people who refused to bear arms, wear uniforms, etc. when drafted. More shockingly, a board was put together to try consciousness objectors. The only people at this time who were allowed to be conscientious objectors were Amish, Quakers, and members of the Church of the Brethren. If the board decided they weren’t sincere enough, they were sentenced. These were no light sentences either, 17 people were sentenced to death, 142 were given life sentences in prison, and 345 were sentenced to penal labor camps for varying time periods. Around 64,700 total Amish, Quakers, and Church of the Brethren members claimed conscientious objector status during WWI. Of those, 21,000 were inducted into the military anyways (out of 30,000 who passed their physicals). Once in the military, about 16,000 of those conscientious objectors decided to fight. The remaining 4,000 continued to refuse to bear arms. 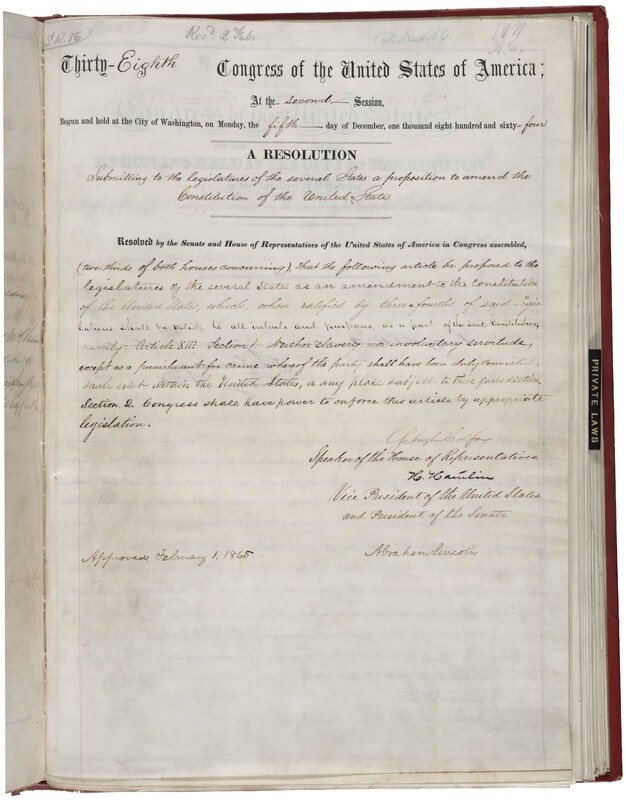 The first state to ratify the Thirteenth Amendment was Illinois on February 1, 1865. Within a week, 10 other states, Rhode Island, Michigan, Maryland, New York, Pennsylvania, West Virginia, Missouri, Maine, Kansas, and Massachusetts, also ratified it. Another potential exception to the Thirteenth Amendment, though this can be argued because public school is somewhat voluntary after a certain point, was ruled by the U.S. Court of Appeals in Immediato v. Rye Neck School District. In the Rye Neck School District, it was required that students perform 40 hours of community service in order to graduate High School, even though this has nothing to do with academics. Daniel Immediato and his parents argued that this “imposes involuntary servitude upon Daniel, in violation of the Thirteenth Amendment; infringes on Daniel’s parents’ Fourteenth Amendment right to direct his upbringing and education; infringes on Daniel’s personal liberty, in violation of the Fourteenth Amendment; and violates Daniel’s right to privacy, in violation of the Fourteenth Amendment.” (The latter point being because after performing their hours of community service, students were then required to write a report and present to the school on how the community service benefited them). The U.S. Court of Appeals ruled that this does not violate the Thirteenth Amendment and dismissed the other points as well. You might want to check your facts as stated. I believe the first try with the thirteenth amendment by Mr. Lincoln was in 1864 not 1964, that would have been Mr. Kennedy except for a little trip to Dallas. There is no such word as ‘anyways’. It is an adverb and therefore cannot have a plural form. @Peter: “There is no such word as ‘anyways’…” “Anyways” has been around since around the 13th century (and if you whip out your trusty Webster’s dictionary, you’ll find “anyways” there). Regardless, there is such a word because I typed it and not a single person was confused about what I was saying. The sequence of letters then successfully conveyed an idea universally understood by those who are literate. So even had it not previously been a word, it would successfully now have become so, with an understandable definition and all. Now, coming up with a word out of thin air would have meant it wasn’t in the dictionary, but the dictionary is always behind the times on the current state of total words in a language. If a new word and definition paring become popular enough, then it will, of course, appear in the dictionary and Grammar Nazis the world over must pick new words to lament about. In this case, you will find “anyways” in the dictionary already. To be clear, I do very much appreciate when people take the time to point out potential grammar mistakes I have made, especially when done politely as you have done. (Most of the time it is not done politely.) I’m not in any way immune to typos and for the most part I like to get rid of them in my writing when pointed out, particularly when they introduce ambiguity. Sometimes I even learn something I didn’t already know, grammatically speaking, though with years of doing this and thousands of articles read by millions of people, that ship has mostly sailed. More often than not, particularly when getting away from some of my early articles which are frequently typo riddled, it is more often a case of a conflict of my grammatical philosophy vs. the rigidly taught principles in educational institutions the world over. To me, language is all about conveying ideas and thoughts, preferably in a clear manner. Getting back to the topic at hand, is writing “anyway” instead of “anyways” any more clear? (Not to mention things like “afterwards”, “sometimes”, “always”, “downstairs”, etc.) Is there any confusion at all introduced by adding an “s” to adverbs? In a similar vein, if I were to say “laters” instead of “later” or “backwards” instead of “backward” or any number of similar modifications, does this disrupt comprehension in any way? Certainly sometimes it can introduced awkward sounding words doing this, but once one is used to reading such an “awkward” modification, it tends to cease to be awkward unless it’s completely outlandish. So if clarity is not sacrificed, I see no reason that some arbitrary rule like “adverbs cannot have plural form” should be rigidly adhered to. One similar such rule that makes no sense is the now antiquated “you can’t split infinitives” rule. In fact, to wildly split infinitives is completely possible. The reasoning behind this rule is simply that you can’t split infinitives in Latin. Hence, even though it was completely possible in English, and sometimes even makes ideas clearer to do so, it was for a long time considered poor grammar as Latin was considered the language of academics and if you can’t do something in Latin, you shouldn’t do it in English. Thankfully, few today consider this “split infinitive” rule valid. You might be interested in this, which says it in a significantly more eloquent way than I ever could. Your rant ignores the fact anyways is listed as informal. Many informal words are listed in dictionaries. Dictionaries do not include informal words to endorse them. Nobody can’t say you don’t use a lot of verbatim to answer a petty remark. I absolutely LOVE the flow of your writing and your wonderful sense of humor! Oh, and the actual content I find remarkable also! I love to see that you take the time to respond to your fans. Thank you for your service to truth! According to my little ACLU blue book, “The CONSTITUTION of the United States of America” it is Section 8 of Article 1, not section 9 of Article 1 wish gives The Congress The Power to declare War…. I learned the so called “Rules of Grammer” in school, & imeditly chose to ignore most of them. Most people find it hard to grasp what I am saying when I verbally express an idea, but as my writing is so much more eloquently stated & tends to flow rather than jump around they usually grasp the meaning right away. I was told by my highschool Modern Lit. teacher that I convied the meaning & depth of books, their authors, and their writing style in a better manner than anyone she had in her class before. I would like to think that she would find you a treasure, as your articles always capture my intrest & convey your meaning concisly & clearly. Thank you so much for the wonderful articles Daven. My teacher also said I was the worst speller she had ever seen & for me to keep a spelling dictonary handy. Please excuse my spelling mistakes. This article was about the law of slavery and Mississippi just getting around to ratifying it and yet the comments were on grammar… so sad. Anyways…the article was interesting and informative. Thank you. A correction is necessary for this post. Mississippi did not make the 1995 ratification “official” until 2013, 148 years after three-fourths of the stares backed it in December 1865. A copy of the 1995 Resolution was sent by the Mississippi Secretary of State Delbert Hosemann to the Office of the Federal Register on January 30, 2013, and was finally officially ratified on February 7, 2013. The movie, “Lincoln,” played a big part in the discovery of this egregious oversight by Mississippi legislators. It’s no wonder people were treated unjustly for so long. I think the justice system should re-visit every prison sentence prior to 2013 and more exposure to this historical travesty should be revealed and revisited until everyone is aware of it.